Photo of 2017 F-150 Raptor courtesy of Ford. 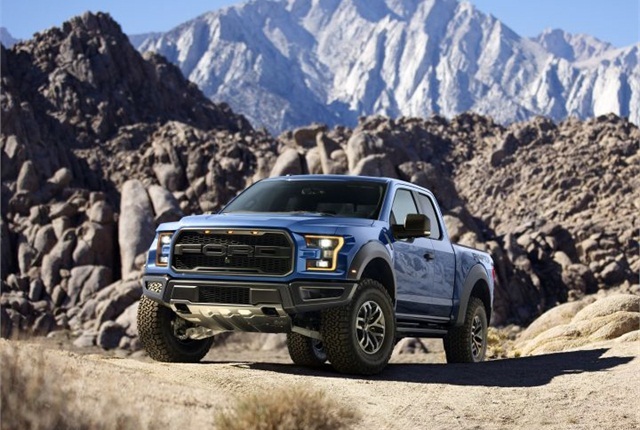 Ford's redesigned F-150-based Raptor truck will incorporate an aluminum-alloy body to reduce its weight by more than 500 pounds when it debuts for the 2017 model year. While the Ford Raptor is mostly an off-road truck for enthusiasts, it has found use with the U.S. Customs and Border Protection's Border Patrol agency, which purchased several hundred around 2011 for its agency to navigate the rugged terrain of the U.S.-Mexico border. The San Diego County Sheriff's Office also uses Raptors. Ford is adding a 3.5-liter V-6 EcoBoost engine to the redesigned Raptor that will produce more horsepower and torque than the current model's 6.2-liter V-8 that produces 411 hp and 434 lb.-ft. of torque. The 2017 Raptor will also get a new 10-speed transmission, advanced LED lighting, and improved camera technology that improves visibility day or night. The 2017 Raptor also gets larger FOX Racing Shox with more suspension travel and new terrain management technology to tackle the toughest trails. The truck will have six pre-set modes for various driving conditions including Normal mode for everyday driving; Street mode for higher-performance, on-road driving; Weather mode for rain, snow or ice; Mud and sand mode for muddy and sandy trails and terrain; Baja mode for high-speed desert running; and Rock mode for low-speed rock crawling.